Back in grade school, when there was a series of typhoons hitting the Philippines, we always had a relief goods drive at school for victims of calamities. During that time, I didn't particularly mind the rains, as it usually signalled Education executive director Nilo Rosas going on the radio and declaring that classes were suspended for the day. Looking back, I realize how remarkable those periods were, not because of the rains, but because of the willingness of our people to step up and help countrymen in need. With the rains this past week, and the super-typhoon to come, we're certainly back in that situation again. I've been trying not to read or listen to the news, because it just depresses me. The heavy rains doesn't just mean suspension of classes anymore. Could you imagine what kind of Christmas those families in the disaster areas would be celebrating? This morning, on my way to work, I was pleasantly surprised that there was a bit of a traffic jam around our building. We share the same compound as the GMA Kapuso Foundation and donations were pouring in. 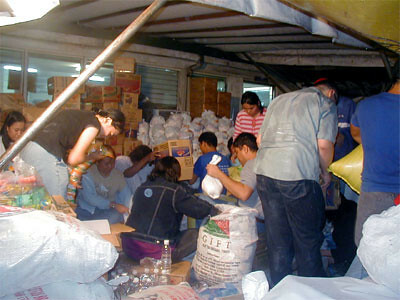 People were hard at work managing the relief items. It's almost 7pm now, and the donations are still coming, as Mel Tiangco broadcasts "24 Oras" right there at the Kapuso office. Despite everything that happened to our country this year, our people still managed to step up. It doesn't make what has happened any less tragic, but it's a good start. The foundation is still accepting donations and relief goods. You could donate the usual stuff that your grade school teachers collected from you from back in the early '90s (clothes, blankets, canned goods, etc.). You could bring your donations to the GMA Kapuso Foundation Offices, EDSA cor. 11th Jamboree, Diliman, Quezon City. You could call them at 928-7021 loc. 437-438 or 928-4299. Michael L. Tan´s article today provides insightful observations on the way we Filipinos respond to our crises. This guy has a remarkable and uncommon common sense I could only hope he is being read by many.